My first encounter with tapestry, or weaving in a broader sense, is one of my first memories. My mom started working at a very young age and spent her little free time in a local art school learning how to draw, paint and weave. At the time I was born, she had a small studio with a vertical loom and several baskets full of yarn. Years later, I remember playing with the skeins and bobbins and trying to “help” her. We moved and she could no longer have a space for weaving, so she eventually stopped weaving. Nowadays, she is more devoted to photography and print media. Some years ago, I had the chance of spending a year abroad in Germany. 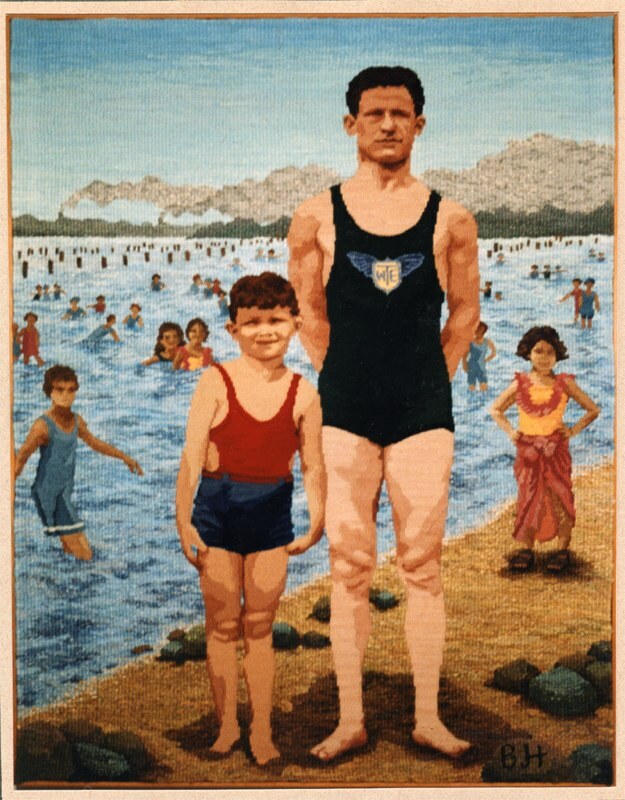 I studied for two semesters in the Bauhaus University in Weimar (Germany) where I got to know the work of Gunta Stolz and other great weavers. Back in Spain, I happened to attend the same school that my mom did for a few months. There I tried different skills, such as spinning, dyeing, and weaving. 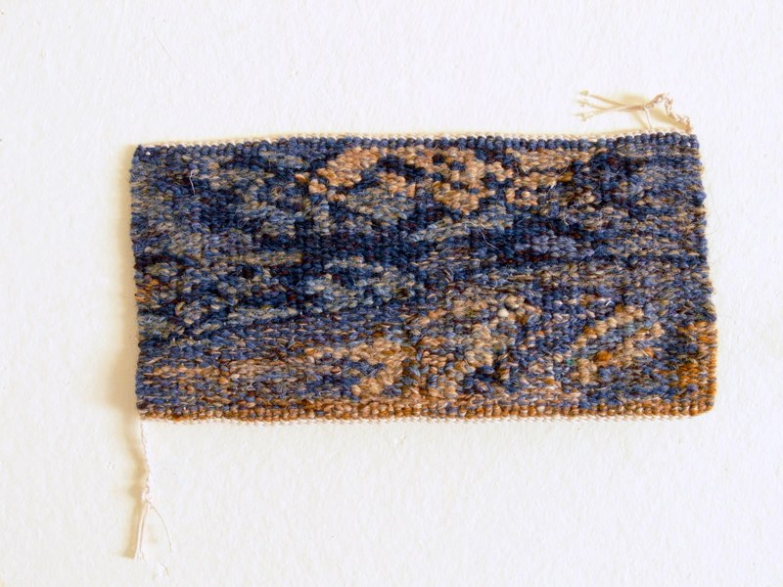 But it was not until last year, when I moved to America to pursue graduate studies in Fiber Art at the Cranbrook Academy of Art, that tapestry weaving became part of my artistic practice. 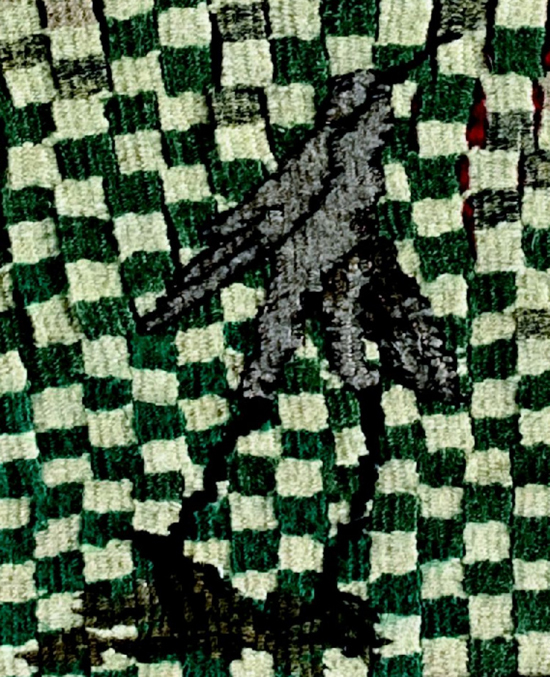 I am especially interested in the similarities between the composition of texts and the construction of textiles. Handweaving becomes a metaphor for writing, recalling your memories, thanks to the slow paced nature of its process, and narrate a story that results as long as your warp allows. 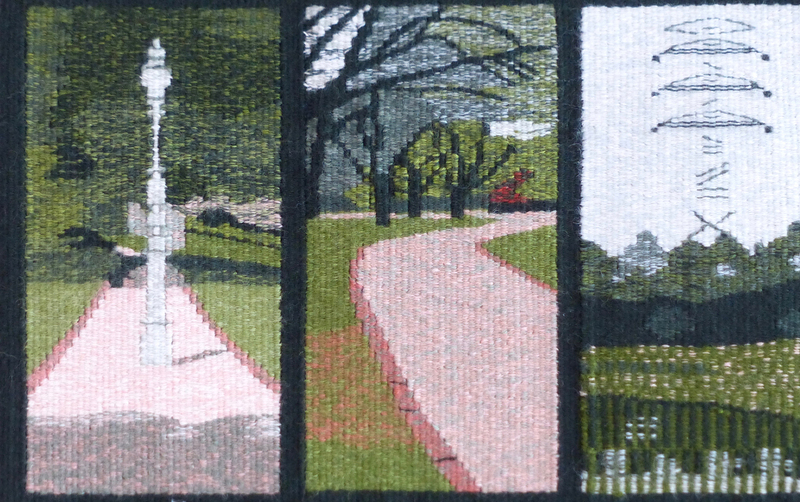 Tapestry weaving allows me to make those texts tangible. A neat change of color separates background from writing, and using a different kind of yarn, maybe thicker or softer, allows the eye to appreciate the different tactile qualities of the work. Yarn works as ink and as paper, and the meaning of the text becomes more complex when loaded with the materiality of fiber. My process starts with the source of text. Sometimes I write my own texts inspired by personal experiences. These works are usually focused on the content of the writing or the strategies I have followed to create it. On other occasions, I have used other people’s texts as an inspiration, calling attention to the peculiarities of different personal handwriting styles and the appearance of the paper used each time. Right now I feel very inspired by “post-it” notes, ruled paper, highlighting markers, and mindless scribbles. 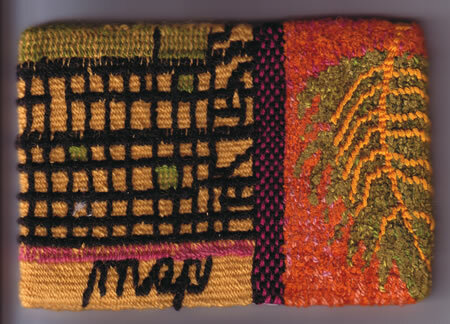 The presence of text in fiber artworks is one of my main topics of research. Both in typeset style or handwriting, letters are very common in embroidery pieces, as in 18th and 19th-century schoolgirl samples, historic cloths such as the Bayeux Tapestry, or in the work of numerous contemporary artists, for example,Tania Candiani and Louise Bourgeois. 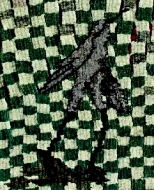 In weaving, text can be found in antique American coverlets using double cloth techniques, but writing is less frequent in tapestry weaving, probably due to the complexity of its construction. That intricacy is probably one of the reasons I love weaving text. It takes a lot of preparation to choose the right yarn and warp density to make your letters readable, to create smooth curves and to manifest the different thickness that a brush or marker can make. Cranbrook is a school where learning is self-directed. Our artists in residence, who are our tutors or advisors, guide us when difficulties and doubts arise and also encourage us to experiment and challenge ourselves. I could say that my creative process is very influenced by my learning process. Every mistake is a chance to find a different solution and sometimes unravelling and starting again allows me to get a new perspective on my work. My weaving practice is not purely tapestry since I combine different techniques depending on my needs in each piece. In some of my works, I make use of loose weft threads, which hang in the back making the piece bulkier and separating it from the wall. In others, I use several colors in the warp to imitate the lines of ruled paper. I also have a tendency to use unorthodox materials, such as plastic or stretchy fabric strips that I cut myself with scissors, which gives each tapestry a more contemporary aesthetic. While I really admire how other tapestry artists have such a remarkable chromatic sense and can blend threads to create very realistic shades, I am more interested in flat colors and using different qualities of yarn to create visual textures. Making traveling part of my research helped me realize how important it is to have a first-hand look at the artwork and not see it only through photographs in books. Last summer I had the chance of traveling to Japan thanks to an award from my current school. Among other places, I visited the Kawashima Textile Factory where they still create tapestries using traditional techniques. They have a very wide loom upon which several people work together weaving cloth as long as 20 yards. These pieces are used as “doncho,” drop curtains for theaters, in different cities around Japan and even in other places outside the country. On smaller looms, they create tsuzure ori weavings, very delicate and detailed tapestries using gold and many colored silk threads. These valuable fabrics are later used in religious temples and ceremonies. Due to my experience and formation, I consider myself more an artist than a craftsperson. The concept, the process, and the result, derived as well from the choice of material and technique, are equally important for me. I respect tapestry weaving as a craft but since I have practiced it for only one year, I know that I have much to learn and I am looking forward to it. Mariana Pinar was born in Granada, Spain, and she holds a BA in Fine Arts and an MA in Art Theory from the University of the same city. Besides working in her artistic practice, she is also a researcher and has been invited as a lecturer to art seminars in Brazil and Portugal. She has also worked in cultural institutions in Berlin and Mexico City and as a costume designer and maker for different puppet and theater companies, as well as for short film productions. Mariana has exhibited her work in different venues in Spain, Germany, Italy, Mexico and the US. Currently, she is a candidate in the MFA in Fiber at the Cranbrook Academy of Art in Bloomfield Hills, Michigan. 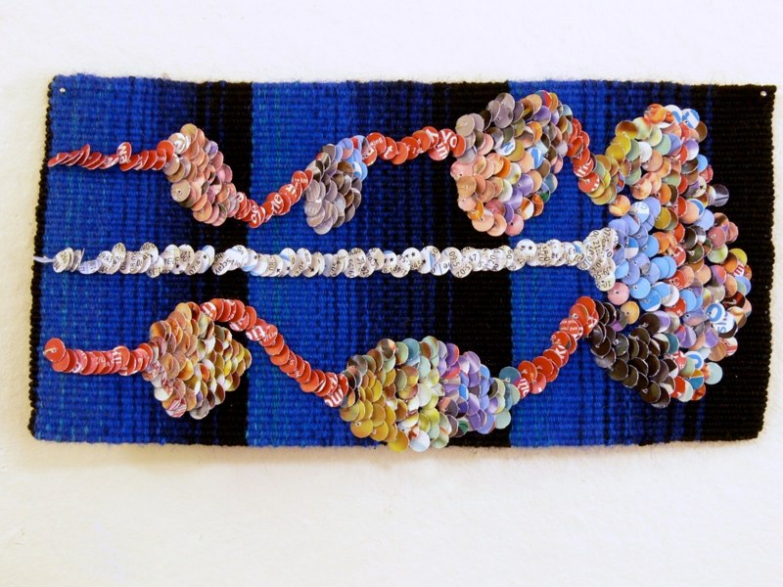 After her graduation in 2017, she plans to continue her artistic practice, work to keep fiber art present in the contemporary art world, and travel to different places to keep on learning.